Well, I’m back from vacation, and what a vacation it was! 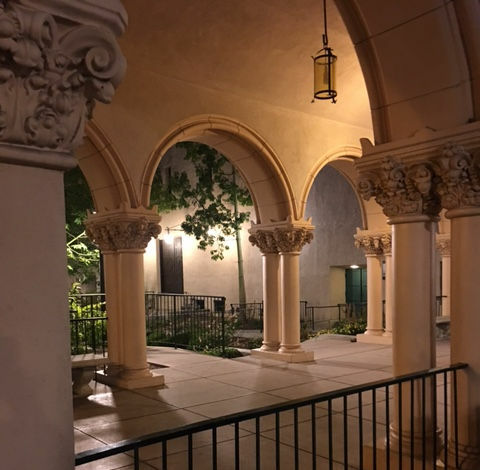 We avoided the touristy parts – no Zoo, no Sea World – and other than splurging on a few movies and restaurants, Tom and I did just about every free thing there was to do in San Diego. Much of our time was spent just enjoying the ocean, the boardwalk, and the bay. We walked, we talked, we people-watched, and we especially loved watching the seals and sea lions! Balboa Park (shown in the photo above) was our favorite place to hang out. The part I liked best was listening to talented musicians play a huge pipe organ in an amphitheater right off the square. What we discovered about San Diego is that the folks who live there are an eclectic bunch who really enjoy life and expressing themselves. Whether they were walking their dogs along the beach (it seems like everyone in San Diego has a dog! ), riding bikes or scooters, or walking on tightropes between two trees, every person we met was happy to stop and talk. 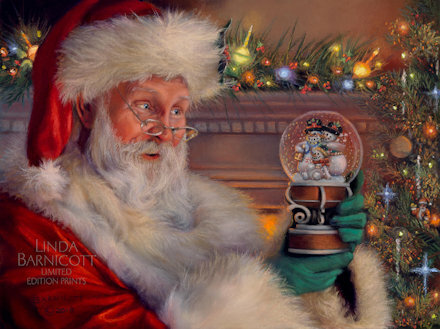 Now for the big announcement you’ve been waiting for…What did I paint in the snow globe that Santa is lovingly holding in his hands? …And the winner of the contest is Sandy Wilkins! I had an amazing number of responses, and I’m sorry I couldn’t answer every one. There were so many great ideas that maybe next time I’ll ask what should I paint instead of what did I paint! I dropped a clue in one of my earlier emails that the snow globe contains something I had never painted before. 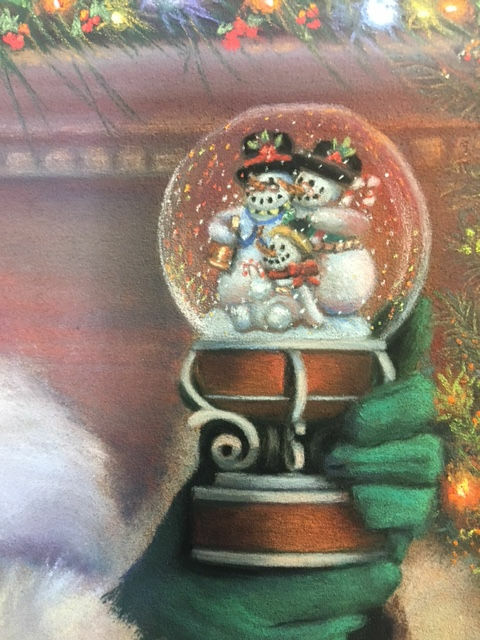 Over the last several years in the Market Square Holiday Chalet, I’ve met quite a few people who are snowman fans and collectors who asked if I would consider putting a snowman in one of my Santa paintings. When I began planning this year’s Jolly Old Elf series, the very first thing I thought of was how I could include a snowman in one of them. I knew I wanted it to be more than just your average snowman, and I wanted it to be fun and friendly. I decided to paint a snowman family to represent the special connection between Santa and our families as well as the bond shared between family members, especially in the holiday season. Thank you all for your participation in this contest. It was so much fun to read all your ideas! The prints are already available on my website under Prints for Sale, “Jolly Old Elf” series. Click here to check it out! Have a great week and a great Fourth of July!